It’s Inauguration Day here in Washington, DC. I have the day off of work because I live a couple of streets away from Arlington National Cemetery and my office is on Pennsylvania Avenue. It’s still a Friday, but the library is closed and I don’t want to turn on the TV. I do want to do something constructive – something that will make a difference and build up my spirits. So, I’m reviewing a book by a local author – by a Spanish-speaking immigrant, even. I want to share with you a book that is adorable, smart, different, and immensely readable. 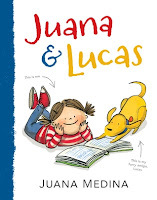 Let’s talk about Juana Medina’s Juana & Lucas. Juana loves many things — drawing, eating Brussels sprouts, living in Bogotá, Colombia, and especially her dog, Lucas, the best amigo ever. She does not love wearing her itchy school uniform, solving math problems, or going to dance class. And she especially does not love learning the English. Why is it so important to learn a language that makes so little sense? But when Juana’s abuelos tell her about a special trip they are planning—one that Juana will need to speak English to go on—Juana begins to wonder whether learning the English might be a good use of her time after all. Hilarious, energetic, and utterly relatable, Juana will win over los corazones — the hearts — of readers everywhere in her first adventure, presented by namesake Juana Medina. Juana is a rambunctious girl who lives in Bogotá, Colombia with her mother and her dog Lucas. Juana loves many things – her abuelos (grandparents), art, her best friend at school, her city (and of course her Mami and Lucas! )… but she does not love learning English. It’s difficult, it’s boring, and she wonders what the point is. When her grandfather tells her that the family will visit Florida, everything changes. Juana MUST learn English! Juana & Lucas is an illustrated chapter book with a lot of heart. Juana has the same sort of thoughts and worries and dreams as any kid – she’s relatable, and she’s smart and fun. While Juana is hilariously lamenting how boring English is, she drops many little tidbits about life in Colombia, and the reader learns a bit of Spanish too – all Spanish words are italicized and understandable in the context of the story. Juana’s happy, functioning family (in a unique environment) is also important, as oftentimes parents in children’s lit are absent, dead, or worse. Author Juana Medina both wrote and illustrated the text, and her art is a colorful mix of black lines and watercolor. The effect is cheery and vibrant, and the simplicity of the figures and outlines is likely to inspire her grade-school readers to imitate and carry on telling Juana’s future adventures. My favorite page spreads were the ones where Juana identifies every item by name. In all, Juana & Lucas is a vibrant, fun early picture book for any kid or kid-at-heart. Recommended for: early readers, reluctant readers, fans of comics and art, and… anyone, really! Fine print: I picked up an advance copy of this title for review consideration from the publisher at Book Expo America.